The Swiss psychiatrist and psychologist Carl Gustav Jung (1875 – 1961) is one (of the many) representatives of the thinkers who approached the First Quadrant from a Second Quadrant point of view. The most famous of his predecessors was perhaps Plato, who introduced his ‘Idea(s)’ as the archetypal representation of the (lost) unity. Since then the idea got many different names, but the process and meaning were always the same: a decision about the division was taken and the totality (of the previous First Quadrant) had to be construed from the new cognitive setting. The question in such a cerebral operation should always be: which division was taken in the first place? Often the philosophers and researchers are not clear on their initial position and Jung is no exception to this rule. A strong line of oppositional thinking is traceable throughout his work, but the interest for the modern times lies in his distinct attention to the four-fold division as well. The idea of such a division – the actual choice – lies in the Second Quadrant and is projected on to the First Quadrant. Jung’s interest in the alchemy might be a first indication of his sympathy in the direction of multiple division thinking. The prime object of alchemy has been the transformation of the (four) elements fire, air, earth and water. The alchemists were only able to think along these lines, because the relation between the elements (the pluriformity) was placed in the context of an Unus Mundus (the uniformity). Alchemy, in its wide fields of study, might be a remnant of a practical form of higher division thinking. The so-called ‘mystical’ aspects were a representation of the belief in an area of invisible invisibility (which is now identified as the First Quadrant). The magician operated with his (magic) thoughts in the Second Quadrant. The alchemist, laboring with the actual chemical operations, made his observations in a Third Quadrant world. The final stage in this abstract process is the impossibility to see the woods from the trees. Feelings can be lost in a Fourth Quadrant. Jung, although intrigued by division as such, was not always clear about his initial choices. He noticed, in his convincing psychological observations, an opposition between the ‘extravertierten’ and the ‘introvertierte’ personalities and also between ‘rationalen’ and ‘irrationalen Typen’. That is unadulterated dualistic thinking. Unfortunately, Jung does not identify his thoughts as belonging to any particular type of division. He passed straight from the obvious contraries (polarities) into a four-division of psychological types (JUNG, 1921/1967; RAZENBERG, 2000). By doing so, he gave the impression that his four-fold typology was born in a numerological context, rather than being the result of a particular type of division thinking. ‘Why did I choose the four types of basic functions is hard to say and there is no a priori reason of it, only to suggest that this view has been formed in the course of a years-long experience’ (JUNG (1921/1967, p. 470). He stated, in this formal declaration, that the use of feelings in a practical setting – also known as experience – was the reason for the choice of (this particular) division. In other words: his (division) decision was taken in a ‘Fourth Division’ environment and was not chosen as a conscious act in the ‘Second Quadrant’. Every person can be classified, in Jung’s view, according to one of these four basic types and the outcome determines the way of ‘seeing the world’ and experience reality (leading to the notion of the Self). 1) Some people base their decisions on intuition, a rather enigmatic realm of the human mind, seemingly without clear rules or predictable lines of thought. The outcome of their actions has reminiscence to the trial and error-method, because there is no apparent logical scheme in the operational method. A distinct contemplative element is present, aiming at a wide (preferably infinite) field of operation. 2) Other people construct a mental picture (thoughts) from a given thought or idea and proceed from this focus point to a comparison with the multitude by means of induction. The ensuing world of general ideas is a storehouse for further action and creates the impression of a non-biased, rational foundation. Limitations and (preliminary) boundaries in the emerging communication will be accepted in order to pursue an effective and analytic research and come to certain conclusions. 3) The third type of personality uses a given, empirical reality to deduct an argument for action. The olfactory, visible or tactile experience of a material substance – which can be anything from the smell of roses to the metallic sound of a money-spewing slot machine – has a directional function in the decision taking process. Delimitation is of prime interest in this approach, and pragmatism is the name of the game. 4) Finally, there are human beings that operate according to the outcome of their feelings. The analogy is used to compare personal experiences. Feelings differ from ‘objective’ ideas in their explicit subjective nature. The boundaries are often difficult to determine in increasing multiplicity. These distinctions of the human mind recall the same approach by the Greek philosopher Empedocles (fifth-century BC) and his division of the physical nature in four immutable elements or roots (fire, air, earth and water) (KINGSLEY,1994). The concept was used again in the application of the temperaments. All four elements (and temperaments) are present all the time, but some are more present than others. The ‘type’ is determined by the greatest visibility of one of the subdivisions at a given time. Kees Razenberg (2000), in an interpretation of Jung, regarded the Self (with its symbolism of the circle, the quaternity and the cross) in a state of balance between the four basic functions of consciousness. The Ego reflects a state of imbalance ‘in the sense that certain functions dominate at the cost of other functions.’ The Ego (as Third Quadrant entity) and the Self (as a representation of the unity the First Quadrant) find their bond in the basic functions, leading to the fifth element (the quintessence). Another important concept in relation to the First Quadrant (as seen from the Second Quadrant) is the process of synchronicity or ‘meaningful coincidence’. Jung developed this idea around 1920 after his contact with Einstein and study of the ‘I Ching’ (HAMAKER-ZONTAG, 1976/2000). The word was coined in Jung’s publication ‘Synchronizität als ein Prinzip akausaler Zusammenhänge’ (in: JUNG & PAULI, 1971). The term indicates the coincidence in time of two or more non-causal events that have a similar intention and meaning. A curious book by Paul KAMMERER (1919), called ‘Das Gesetz der Serie’, was published about that same time and its appearance fits into the very definition of the word synchronicity. Kammerer called the phenomenon ‘seriality’ and described many amazing events and weird coincidences. 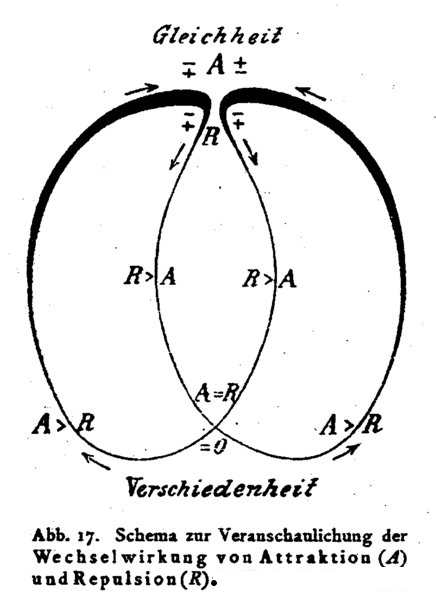 Attraction (A) and repulsion (R) as working parameters of synchronicity given by the German naturalist Paul Kammerer. In: KAMMERER, Paul (1939). Das Gesetz der Serie. Eine Lehre von den Wiederholungen im Lebens- und im Weltgeschehen. Deutsche Verlagsanstalt Stuttgart und Berlin. The Dutch psychologist Jan Hendrik VAN DEN BERG elaborated on the theme of the contemporaneity (synchronicity) of historical phenomena. His interest came as part of a theory of changes, which he called – with a neologism – the metabletic method. The book on this subject ‘Metabletica of leer der veranderingen’ was translated as ‘The Changing Nature of Man’, and appeared in 1956. Van den Berg took ‘contemporaneity’ (as a First Quadrant-feature of unity and eternity) out of its context and placed it in the Second Quadrant (of multiplicity and actuality). His basic statement is that there is always some sort of connection between (historic) events, which occur simultaneously. The metabletic method consisted of four stages. Firstly, the notion of the change. Secondly, the moment of its first appearance, which has to be traced. Time has obliterated or diffused the actual change in thought, but an epoch-making book or event often remains as a visible trace. The choice of this book (the third step) holds the key to deeper understanding. The fourth and final action is a study of the effects of the noted change followed in time. These steps in the ‘metabletic approach’ fit in with the quadralectic approach. Van den Berg (1963) described examples of the metabletic approach. He noted, for instance, the growing importance of the (two) division as a leading mental feature in the early eighteenth century. The year 1740 was boldly labeled as ‘the Year of the Division’. The key-books to give an insight in the new sense of division were, according to van den Berg, David Hume’s ‘A Treatise of Human Nature’ (1739) and Samuel Richardson’s ‘Pamela or Virtue Rewarded’ (1740). 1. The discovery of two types of electricity (vitreous and resinous) by Charles Francois du Fay (1698 – 1739). He was the superintendent of the gardens of the king of France and discovered that rubbing two different objects together produced two types of electric charge. Matter contained two types of fluid, in his view, which were normally in exact balance. This equilibrium was disturbed when two bodies were rubbed together. The dual character of electricity (positive and negative) has never been challenged since its introduction in the eighteenth century, although there is a strong ‘philosophical’ component in its existence. It is possible, from the quadralectic point of view, to regard the dualistic electrical properties of attraction and repulsion as the result of an internal shift of particles of a higher division order, rather than of ‘charged’ particles (protons and ions), as seen in modern physics. It is a challenging thought to explain the intensio (attraction) and remissio (repulsion) which originate in the atomic model in terms of a dynamic shift in stead of an electrical charge. 2. An attack on the fifth theorem of Euclid by Giovanni Girolamo Saccheri (1667 – 1733), which resulted (later) in a non-Euclidean geometry. Saccheri was a professor of philosophy in Turin and taught mathematics at the University of Pavia (1697). Euclid assumed – around 300 BC in his book ‘The Elements’ – that straight lines were infinite, and parallel lines never meet. The crossing of an infinite straight line with two parallel (infinite) straight lines, as in Euclid’s fifth postulate, gave a conflict of understanding. Saccheri sensed that problem (of two infinities) and worked on its solution. 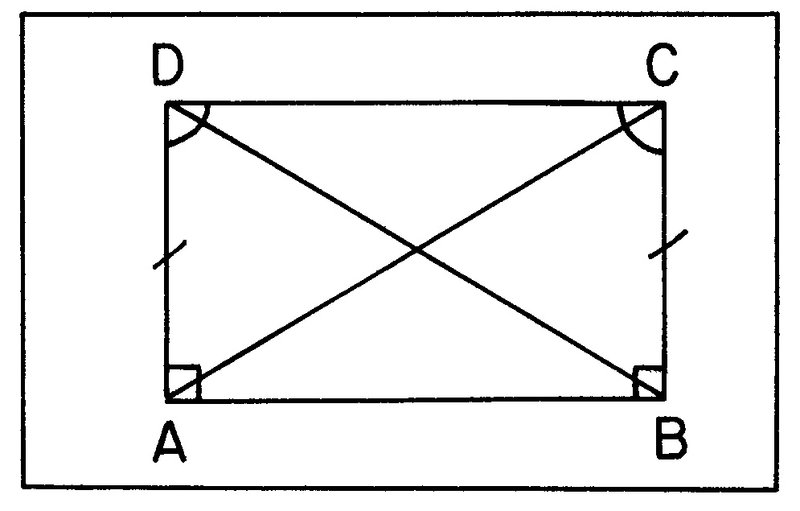 The quadrilateral (fig. 21) was used for better comprehension. Fig. 21 – A drawing of the Saccheri quadrilateral to explain the problem of Euclid’s fifth postulate. The Saccheri quadrilateral has equal summit angles at D and C. Giovanni Girolamo Saccheri (1667 – 1733) was a professor of philosophy in Turin and taught mathematics at the University of Pavia (1697). Euclid assumed – around 300 BC in his book The Elements – that straight lines were infinite, and parallel lines never meet. The crossing of an infinite straight line with two other parallel (infinite) straight lines, as in Euclid’s fifth postulate, gave a conflict of understanding. Saccheri sensed that problem (of two infinities) and worked on its solution. GREENBERG, Marvin J. (1972/74). Euclidean and Non-Euclidean Geometries. Development and History. W.H. Freeman & Co,. San Francisco. Saccheri considered a number of non-Euclidean theorems without completely realizing the revolutionary nature of his investigations. ‘It was as if a man had discovered a rare diamond, but, unable to believe what he saw, announced it was glass’ (GREENBERG, 1972). Bolyai prepared, between 1820 and 1823, a treatise on the complete system of non-Euclidean geometry, but he discovered even before publication that Gauss had anticipated much of his work. Non-Euclidean geometry reached another peak with the introduction Einstein’s theory of relativity and the assumption of a curved time-space. 3. The development of the binominal nomenclature of plants by Carl Linneaus (1707 – 1778; fig. 22) was seen by Van den Berg (1983) as the third major indication of oppositional division thinking. The Swedish biologist was described by Tore FRÄNGSMYR et al. (1983) as a ‘perceptive observer but also a troubled individual with a deeply pessimistic outlook on life.’ He believed that everything had to be arranged to give it discipline and order. Without a system, chaos would reign. He published his ‘Systema naturae’ in 1735, introducing a binominal nomenclature, which is still in use today. Fig. 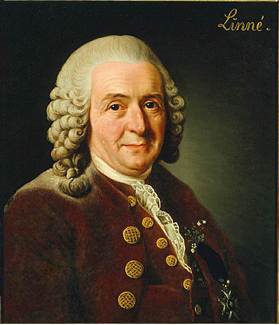 22 – An oil painting of Linnaeus (Carl von Linné) by Alexander Roslin (1775), now in the portrait collection at Gripsholm Castle (Mariefred, Södermanland, Sweden). A société linnéenne was even founded in France (in 1787), despite a firm opposition towards Linnaeus’ artificial system by such notable scholars like Georges-Louis Leclerc, Comte de Buffon (1707 – 1788; in his ‘Histoire Naturelle’ (1749/1767), Michel Adanson (1727 – 1806) and Bernard de Jussieu (1699 – 1777) (DURIS, 1994; STAFLEU, 1971). Only recently the taxonomical system has come under renewed attack from scientists, who want to include the genetic history in the name and propose a system based on phylogenese (comprising the evolutionary background). Later in life, Linnaeus developed curious speculations, for instance, of a five division (numero quinquenario) in the ‘Clavis Medicinae’ (1766) and a twelve-division in the ‘Metamorphosis Humana’ (1767) in which the ages of man were discussed. Furthermore, he used a climacteric scale of seven (teeth/7; puberty/14; apex of life/42; sexual drive extinguished/63; child again/70). He was influenced by Andreas Caesalpinus (1519 – 1603), who brought the first botanical system in the modern sense in his book ‘De Plantis’ (1583). He also believed that ‘plants should be arranged like armies arranged for battle’. The metabletic approach (van den Berg) and the notion of synchronicity (Jung) and/or seriality (Kammerer) are, in a practical sense, explorations in the world of analogy. The search for the ‘timeless time’ or the coincidentia oppositorum is the sincere effort to exclude the subjectivity (of a choice) from a communication. However, that fully unattached state is hard to imagine in the real world. The very realization of synchronicity or seriality – as subjective events – makes it clear that coincidences find their origin in the criteria, which are constructed ‘to let it happen’. And the choice of the division environment is probably the most important touchstone in that process. The more limited an initial division, the more often ‘things will happen’. In the ultimate unity (UU), all things will happen all the time, at the same time. The conscious acknowledgement of this situation points to the Second Quadrant, as the designated place where the initial division took place. The circle closes in. The analogy, as a process of the Fourth Quadrant, is just as intertwined with the generation of ideas in the Second Quadrant as vice versa. The subjective intervention takes place in both quadrants to limit the field of observation. The ancestry of unity, with its hind of infinity, is incorporated in the muun, the (human) construction of that unity in a multiple world (after a conscious division has taken place in the Second Quadrant).